Fashion and clothing style in the 1920s were a major departure from the late 19th century and early 20th century fashions. And according to many fashion experts, the 1920s marked the beginning of the modern era fashion. Both men and women abandoned highly formal and restricting attire, while their style of clothing in a large extent reflected a change in all segments of life. Women’s fashion in the 1920s reflected women’s changed role in the society. They got the right to vote and entered the workplace, and as a result, their style of clothing became more comfortable and practical. But it also became more masculine which was a complete opposite to what women wore in the first two decades of the 20th century. 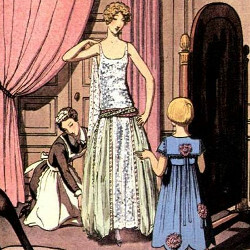 By the mid-1920s, most women fitted the description of a classic flapper girl, wearing strait shift dress which created an appearance of flat chest and sort of boyish figure. Accessories, on the other hand, were highly extravagant. Hairstyles got shorter to look well with tight fitting hats and head bands which were extremely popular. Just like women’s fashion, men’s fashion changed a lot in the 1920s although men’s 1920s clothing style can be described as classic. Men gave up the old long jackets (these continued to be worn for formal occasions) for short, high waist jackets with narrow shoulders which created a thin figure. Trousers were relatively narrow but in the mid-1920s, the so-called Oxford bags became fashionable in both Britain and the United States. Loose baggy trousers started to be worn by the Oxford undergraduates in order to be able to wear knickers underneath. During the 1920s, many men also began wearing various sport clothes such as sweaters and short trousers. Just women, most men in the 1920s were also wearing hats – the choice depended greatly on the class. Middle class men typically wore a fedora or bowler hat, while upper class men continued to wear the so-called top hat or a homburg. Working class men usually wore a newsboy cap or flat cap. The 1920s fashion and clothing style were also influenced greatly by development of new fabrics such as rayon although natural fabrics such as cotton and wool were the first choice. Silk was highly desirable but it was expensive due to limited supply. Fashion designers preferred luxury fabrics including silk, satin and velvet but middle class fashion conscious men and women mainly wore less expensive versions which were made from synthetic fabrics.